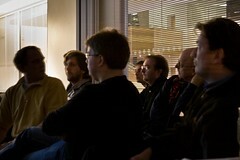 On June 1st we had the second user group meeting in Cardiff. It was quite an impressive turnout and I would like to say thanks to all those who came along. We do have a nice group of people building who share a passion for the Windows Phone platform. It can only go from strength to strength. Thanks to Nick Ajderian from www.hattjoys.co.uk for providing a very entertaining and passionate talk on getting data from Twitter and chucking it on a map – Shame that the internet connection was poor and Nick had to resort to well prepared backup plans. Next time we won’t leave everything to the venue. Thanks also to Iestyn Jones for demoing his good looking application Welsh Kitchen. Iestyn has actually published 4 applications to the market place (search for ‘Bugail’ in Zune) and received his XBox from the Think.Dev Rewards program. One thing that I failed to mention was the alternatives to the Preemptive analytics. There is an Analytics library on Codeplex that supports Windows Phone 7 and different analytics (that’s way too many uses of the work in one paragraph) services such as the one provided by Google. We have lots more planned for upcoming meetings (the next likely to be mid July) so watch this space. One of my applications on the marketplace is the countdown tile application. This is a simple application that when pinned to the home screen lets you see a countdown of the number of days until a certain date. This application has recorded 6299 unique users to date. It’s had a mixed bag as far as reviews is concerned but this is mainly down to the fact that the tile update isn’t the most reliable mechanism on the phone system (something for another blog post to come soon). With this and the fact that some of the new updates to the live tile services within the Mango platform update that is coming has prompted me to create a control that lets user be a little more creative with the tile that they would like to create. I am in the early stages of putting together a Tile Maker control that presents the user with an area the size of a standard live tile. Behind this area can be placed an image that the user wants to use within the tile. This image can be moved around by using multi-touch gestures. Once the user has the image in the desired place they can then take a snapshot of the tile area to use as the live tile. Let me know what you think and if you will find this control useful. Also if you can think of any additional features then pop them in a comment on this post. Being a windows phone developer I must say that the Mango platform update has me very excited (except a 30min and 15 second agent restriction leaves me underwhelmed – but that’s another story). One aspect of Mango that Microsoft have announced is the inclusion of two new market distribution models those being Beta and private distribution. As this post mentions the idea that you can’t restrict the use of the application to a set of users rules out the private model for enterprise distribution. In my opinion the enterprise has been supported from day one all that you have to do is consider the mechanisms that you are going to use to stop anybody from making use of your enterprise application. If you consider the fact that your code can gain access to the devices unique identifier then you will be able to identify the device that your code is running on. A phone user downloads the application. The user starts the application. The application asks the user for the Key that the company has provided via email (Thankfully we now have cut/paste to copy the key to the clipboard). At this point the user does not have access to the key as this is the applications 1st run, so the user is presented with another button that will generate the key request (this should always be present until the application has received a valid key).. The key is generated by code it will incorporate the devices unique identifier. This code is hashed and can be decoded by the companies systems. Once the key has been generated the app launches a new email with the key included in the text. The email is addresses to the right email address. The company receives the email from the phone user and verifies the email address that the request has come from. A key that will unlock the application is generated and sent to the originating email address. Once the user has the key they can enter it into the application and away they go. I know this isn’t perfect and you can probably pick a million holes in it (feel free to do so by posting a comment) but it does illustrate that rather than wait for the distribution channels to be created you can always work around them. Someone did point out that marketplace certification may be a sticker here . You would have to let the Microsoft testers know about the process via adding notes into the application submission. Part of the agenda for each WPUG meeting is to give time for people to demonstrate their application to the rest of the attendees. These applications can be a finished product or something that has just been started by the developer. This I see as a valuable opportunity for the developers as they get a change to see what people think face to face rather than waiting for feedback or even the emails to their support address. There is also one other even more important opportunity that is that could be created by the application demonstration. An example of this is the continuing story behind the TaxiRoute application. 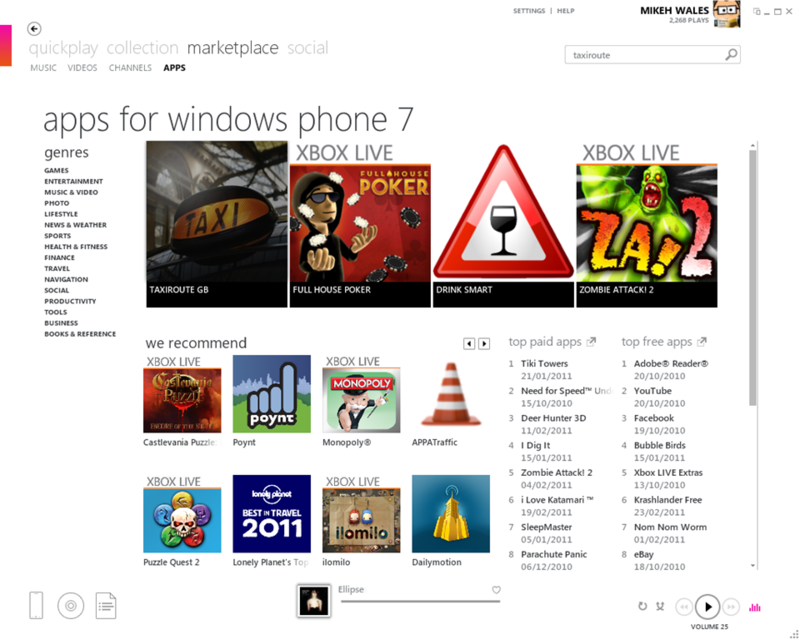 On March 17th 2011 (St Patricks Day) the application was promoted to be the featured application within the Marketplace. 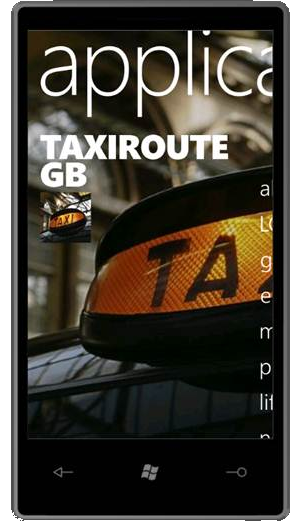 The rest of the story behind the development of TaxiRoute is one of a dogged determination of the managing director Trevor Daniel to create a database that holds the local authority hackney carriage tariff data for the whole of GB (Northern Ireland not included). Once this information was completed Trevor built a web site www.taxiroute.co.uk and offered it out to the public. The web site now records around £1M in value of enquiries each month. Not only does the web site approximate the charges of the taxy ride you want to take (the web site can not take into account waiting time for metred charges and therefore only provides a best case estimate) it will also provide a list of local firms, along with their telephone numbers. As you can image when you are out and about you a web site isn’t the best way in which to get the information an obvious progression would be a phone application. Hence TaxiRoute GB was created. Trevor decided to put his application forward to be demonstrated at the 1st Cardiff WPUG meeting on March 2nd where we were fortunate enough to get a date that had Paul Foster and Mike Ormond attend. Paul was impressed by the story that led to the development of the application and also impressed by the concept, so he pushed the application at the guys in the UK windows phone marketing. The upshot of this being that the application has been considered an App Hero and has featured in a couple of ways and also be pushed within the social space. Although the WPUG meetings (in London and Cardiff) won’t always be attended by members of the Microsoft DPE team it’s the connections that we have with these guys that make attending worth while even if you haven’t yet got that killer app to demonstrate. The insight and understanding that you will gain along with the possible opportunity’s like the one that TaxiRoute has been given are just not worth missing. Ok so meeting Number 1 down and definite call for more! From the feedback that I have received people did find it very useful and they are also expecting more. To add a package you will find the ‘Library Package Manager’ menu item under tools from here select ‘Add library package reference…’. Anything i mentioned in my talk that I missed? We were lucky enough to get Mike Ormond and Paul Foster from the Microsoft DPE team. Both Paul and Mike are the UK evangelists for the Windows Phone platform. 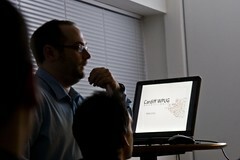 Also attending was Matt Lacey the founder of the WPUG event in London. One thing to note is that the meetings won’t always be attended by members of the Microsoft DPE team but they are very happy to support our efforts and will be attending on occasion. The main WPUG web site is: http://www.wpug.net/ with @wpug being the twitter account to follow. I have also created the Cardiff WPUG account to post announcements and details of the Cardiff based events: @cdf_wpug This account will follow our members so should be worth following. Last thing that I want to do is lose that momentum, but I do have to decide how often the meetings can and will happen. For for this I will need to get an idea of what subject matter people would like talks on and also I would like to find volunteers to present talks. From our registration forms there were eight people who expressed a willingness to contribute so now it the time to put your money where your mouth is. Deeper Dive into the MVVM Pattern. Using the Preemptive Dotfuscator and adding analytics to applications. Are there areas you would like covered? If you do then post a comment here. Comments are moderated so it may take a little while for your comment to appear. Once I have a a good idea of what we can offer our members in terms of talks and support then I can decide how often the meetings can happen. WP7 Text Boxes – OnEnter (my 1st Behaviour). One problem I have encountered on various WP7 apps (including my own applications) is moving between text boxes on a page. The problem can present itself when the SIP is being displayed in front of the next control that requires input. In some cases the user is forced to press an area on the page that does not include a text control to take the focus away from the text box. 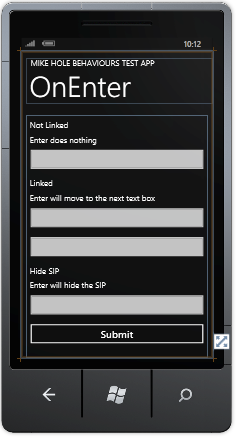 Once the SIP is hidden then the user can click the control they want to enter text into. This is mainly because the controls do not support the concept of tab order because the SIP does not include a tab control to move between controls. This could prove to be a pain for developers and forces additional code within the page code file that can be said to be quite untidy. It is because of this that I have created my own solution using a behaviour that can be attached to a control. One advantage of this is that it will be possible to set the values using Blend therefore reducing the reliance on the developer. You can download the project from here. (if you have any problems downloading this then please send me an email at: mike [at] mikehole [dot] com and I will send it on). If you can think of any ways that the behaviour can be improved or know of any better solutions then feel free to leave a comment.